You’ve come to the right place. Find immediate answers to your questions. Our fleet of colorful orange-and-green trolleys travel through San Diego and Coronado frequently on a continuous twenty-five mile loop. Start your tour at any one of our convenient stops and tour throughout the entire day. Stay on board your trolley and enjoy our fascinating narrative, presenting a great overview of “America’s Finest City”, until you return to your starting point in approximately two hours. Depending on your start time, you may also use your ticket to enjoy your tour in segments by hopping off at one or two of our distinctive stops on the loop. Each stop offers a unique aspect of San Diego for you to explore. When you are ready to continue your tour, simply hop on the next available trolley; trolleys arrive approximately every 30 minutes. The number of stops you can explore in one day depends on the time of year that you are touring and the amount of time you have on the day of your tour. 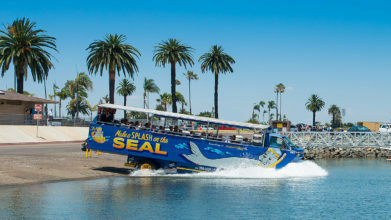 For your convenience, we offer two-day passes as well as discounted Old Town Trolley and SEAL Tour Combination Packages! Please ask our staff at any of our Trolley stops how to best plan your day. Old Town Trolley: Reservations are not required. La Jolla & San Diego Beaches Day-Tripper Tour, SEAL Tours, Ghosts & Gravestones and City Lights Night Tour: Reservations required. Reservation based tickets are non-refundable. You may reschedule up to 24 hours in advance of tour time. SEAL Tours: Please check in 30 minutes prior to tour time. First to check-in, first seated. No on-site refunds allowed. Late check-in may result in a forfeited reservation. Old Town Trolley and Beach Tour: 4-12 years. Children under four ride free. SEAL Tour: 4-12 years. Children three and under pay a lower fee. Ghosts & Gravestones: 0-12 years. Yes, we can accommodate passengers with disabilities. We ask for 24-hour advance notice to best accommodate you. Call 619-298-8687. For more information, go to accessibility services. The Old Town Trolley team, part of Historic Tours of America Group Sales office, can give you information on group rates or renting our vehicles for special events. They can be reached at (866) 754-0966. For small groups, our Internet discount may be the best option. For more information, go to San Diego groups and charters. For information, go to accessibility services.